You are what you eat. Or so the saying goes. Science now tells us that we are what the bacteria living in our intestinal tract eat and this could have an influence on how well we age. Building on this, McGill University scientists fed fruit flies with a combination of probiotics and an herbal supplement called Triphala that was able to prolong the flies' longevity by 60 % and protect them against chronic diseases associated with aging. The study, published in Scientific Reports, adds to a growing body of evidence of the influence that gut bacteria can have on health. 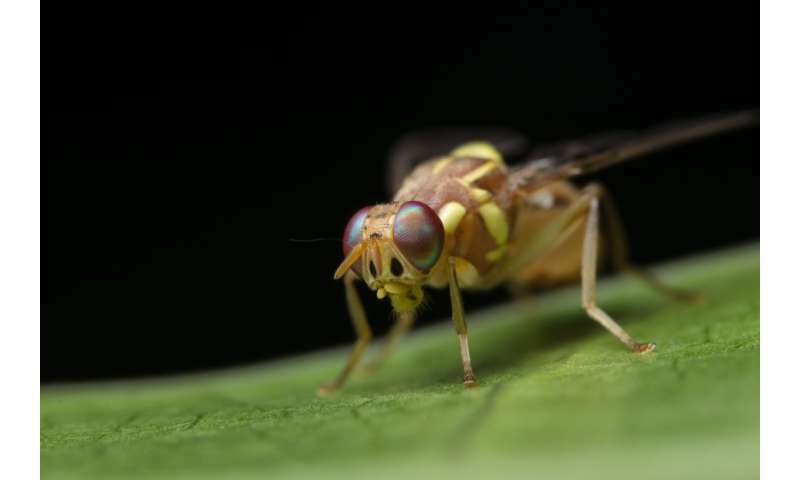 The researchers incorporated a symbiotic—made of probiotics with a polyphenol-rich supplement—into the diet of fruit flies. The flies fed with the synbiotic lived up to 66 days old—26 days more than the ones without the supplement. They also showed reduced traits of aging, such as mounting insulin resistance, inflammation and oxidative stress. "Probiotics dramatically change the architecture of the gut microbiota, not only in its composition but also in respect to how the foods that we eat are metabolized," says Satya Prakash, professor of biomedical engineering in McGill's Faculty of Medicine and senior author of the study. "This allows a single probiotic formulation to simultaneously act on several biochemical signaling pathways to elicit broad beneficial physiological effects, and explains why the single formulation we present in this paper has such a dramatic effect on so many different markers". The authors also say that the findings can be explained by the "gut-brain axis," a bidirectional communication system between microorganisms residing in the gastrointestinal tract—the microbiota—and the brain. In the past few years, studies have shown the gut-brain axis to be involved in neuropathological changes and a variety of conditions such as irritable bowel syndrome, neurodegeneration and even depression. Few studies, however, have successfully designed gut microbiota-modulating therapeutics having effects as potent or broad as the formulation presented in the new study. Susan Westfall, a former Ph.D. student at McGill and lead author of the study, says the idea of combining Triphala and probiotics comes from her long-standing interest in studying natural products derived from traditional Indian medicine and their impact on neurodegenerative diseases. "At the onset of this study, we were hopeful that combining Triphala with probiotics would be at least a little better than their individual components in terms of physiological benefit, but we did not imagine how successful this formulation would be," says Westfall, who is now a postdoctoral fellow at the Icahn School of Medicine at Mount Sinai in New York, USA. In the case of human health how problematic is the appendix as a reservoir for : #1 the healthy homeostasis micro biome? #2 the pathogenic bacteria - dis biome resulting from food poisoning resulting in chronic disease? Seems as if an efficient appendix would insure retention of a micro biome - of either catagory - both just as likely - and treatment should consider the appendix as a possible limitation to a positive outcome.